How To Change Font On Android Phones Many friends asking me about this. So am including this article for you. GO Launcher Ex is one of the greatest and popular Android launcher application that allows you to change your device fonts and provide your Android device a new look with amazing colors and styles. GO Launcher Ex also offers different types of wallpapers to make our screen more attractive. It is available on Google Play Store for free. This app can also lock Apps with Pattern and pin lock. It supports 4M apk to increase our device performance. It also provides transformation effect to each slide. GO Launcher Ex is a lightweight application with attractive and easy to use interface. Approx has 200 million users. We have already listed out some most popular Android Launchers. Step to Change Android Font Using GO Launcher EX. 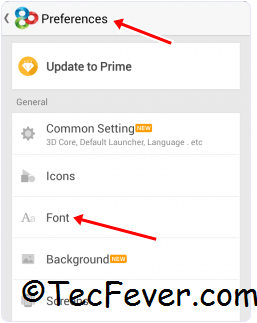 Step 2: Now, you have to install the GO Launcher Fonts from the Play Store or by clicking the Below Download button. GO launcher font is an Amazing App that provides different variety fonts. Step 3: Open the Go Launcher App from the device, and the home screen of Go Launcher Click the Menu button at right corner. Step 4: Select the Preferences from the list then look for the font option. Step 5: Now you see the list of fonts provided by the app then choose the font of your choice. Step 6: You can manually install the font files to the path /sd card/GOlauncher Ex/fonts. Step 7. After doing the modifications, changes take place quickly without restarting the Phone. 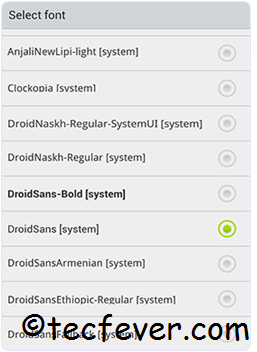 We hope this article will help you to change your device font without root access. This is very helpful for Android users. Share it with your friends and teach them about this simple method. Tec fever always here to help you. Comment below if you have any doubts. Thanks.